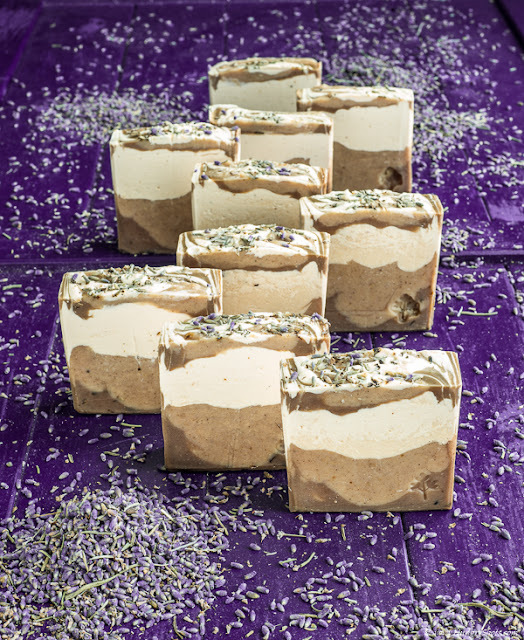 I had in mind for a while to make a lavender soap. As I have some extra essential oil that I brought from Province, I was thinking to preserve it better in a soap rather than in a bottle. Everything went smooth with no major failure except the coloring. I had a violet powder color and I wanted to make the soap with nice shades of violet. I read the label and it was clearly indicated to be used in other types of cosmetics but not in soap. But I had no other similar colors so I gave it a try anyway. In the end, maybe not surprisingly after reading the label, the color turned into brown. Although it was not the color I wished for, the soap got nice shades of brown and I am happy the way it is. It is not made to be sold anyway, so being just for my own use or for a gift to my closest friends, the color is more related to the artistic part.